The Bf-109, or Me-109, is arguably one of the best fighter planes that came out of Germany during World War II. Although the Fw-190 was more advanced than the early versions of the 109, more 109s were produced than any other aircraft in Germany and are credited with the most kills. A topic of discussion in movies and documentaries alike, there has always been a discrepancy over what its real designation is. 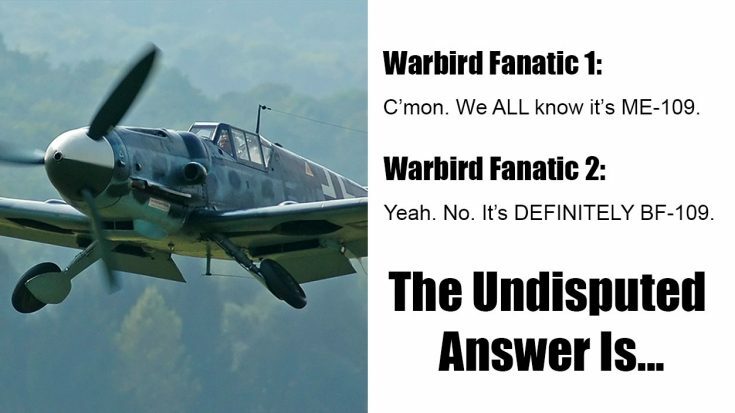 Some people say Me-109 while others Bf-109 and the debate is as old as the aircraft itself. There is, however, a clean and clear answer to this argument. Almost 34,000 Bf-109s were produced during World War II from 1935 to 1945. The video below will explain in detail what the difference is between the two, but here is the basic gist of it if you don’t have time to watch it. Although it would make perfect logical sense to call this aircraft “Me-109” as it was built by Messerschmitt (the first two letters being its designation as in Fw-190 for Focke-Wulf), the aircraft was first built under a different company. In 1935 when it first flew, these aircraft were built by a company called Bayerische Flugzeugwerke, hence the designation of “Bf.” In 1939 Willy Messerschmitt became the new owner of the company and renamed it after his last name. Since then, all of the variants built before 1938 had a “Bf” designation and all the subsequent ones the designation of “Me.” For the sake of simplicity, most people just retained the designation of Bf for simplicity.